WASHINGTON (Reuters) - Canada and the United States showed scant sign on Thursday of closing a deal to revamp NAFTA, and Canadian officials made clear Washington needed to withdraw a threat of possible autos tariffs, sources said. The administration of U.S. President Donald Trump wants to be able to agree a text of the three-nation North American Free Trade Agreement by the end of September, but major differences remain. “We discussed some tough issues today,” Canadian Foreign Minister Chrystia Freeland told reporters after meeting with U.S. Trade Representative Robert Lighthizer. Freeland, who has visited Washington four weeks in a row to discuss NAFTA, gave no further details. Market fears over the future of the 1994 pact, which underscores $1.2 trillion in trade, have been regularly hitting stocks in all three nations, whose economies are now highly integrated. While multiple deadlines have passed during the more than year-long negotiations to renew NAFTA, pressure on Canada to agree to a deal is growing, partly to push it through the U.S. Congress before Mexico’s new government takes office on Dec. 1. Canada says it does not feel bound by the latest deadline. Asked whether time was running out, Freeland said her focus was getting a deal that was good for Canadians. Trump came to power last year vowing to tear up NAFTA unless major changes were made to a pact he blames for the loss of U.S. manufacturing jobs. Trump struck a side-deal on NAFTA with Mexico last month and has threatened to exclude Canada if necessary. He also said he might impose a 25 percent tariff on Canadian autos exports, which would badly hurt the economy. Jerry Dias, president of Unifor, Canada’s largest private-sector union, who was briefed on the talks by Canada’s negotiating team, said Ottawa insisted that the tariff threat be withdrawn. “Why would Canada sign a trade agreement with the United States ... and then have Donald Trump impose a 25 percent tariff on automobiles?” Dias told reporters. “That for us is a deal breaker. It doesn’t make a stitch of sense. ... We are a small nation, we’re not a stupid nation,” added Dias. Freeland said she would return to Canada on Thursday ahead of a two-day meeting of female foreign ministers she is co-hosting in Montreal. Early next week she will be in New York for a United Nations session. Ottawa is under pressure from some sectors to abandon its insistence that a bad NAFTA is worse than no NAFTA. Reuters and other outlets reported in August that a side letter with Mexico would cap tariff-free or nearly duty-free Mexican imports to the United States at 2.4 million vehicles. 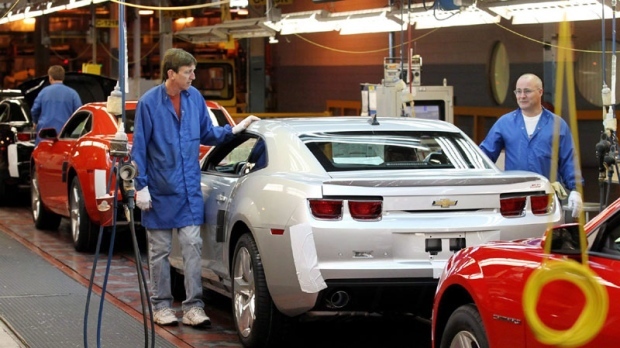 U.S. automakers privately question why the United States would seek to cap Canadian exports to the United States, given that companies are unlikely to expand production in Canada compared with lower-cost Mexico.